Book 6 – Blown Away! Itchy is married to a badger called Matty, whose fur takes a lot of grooming as it is a tangled mess most of the time (hence the name). Matty wakes up every day looking as if all her fur has just been brushed up the wrong way, but she has the most amazing, sparkly eyes. Grooming Matty can take some time, hours, even when Itchy helps. Nothing pleases Matty more than keeping her sett clean and cooking hot worm stew, Itchy’s favourite!. She also likes to help in keeping the sett walls nice and safe, the floors are covered with bracken or grass, which gets changed every day in preparation for the time she has her cubs, Humbug and Clawdia. Badgers have separate rooms, a bit like we do and she takes great pride in furnishing her new home. 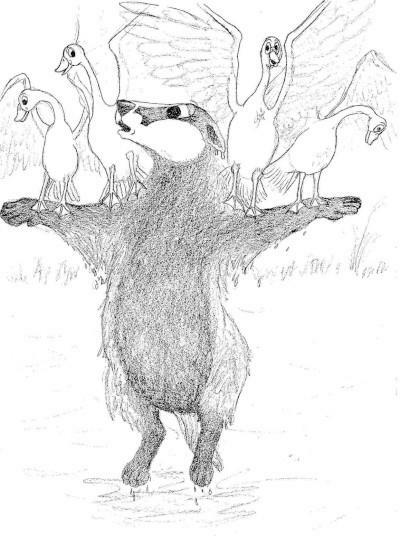 Matty can’t swim very well, which is unusual for a badger (this is because I can’t swim well either and the original story wasn’t intended for publication, it was purely to make my sister smile!). One spring day Matty comes across a piece of blue tarpaulin, which she uses as a carpet and a dustpan and brush, which also comes in very useful. (This is also true, my sister and her husband were renovating their house and these items disappeared from outside their back door and turned up at the entrance to the sett!). Please take a look at our (Facebook) page and like/share.